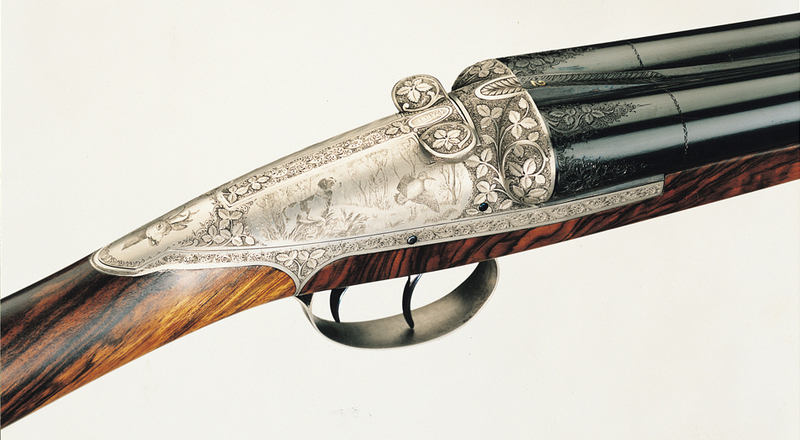 Régis Darne established his gun-making business in Saint Etienne in East Central France in 1881. Saint Etienne had become an arms making center as far back as the 16th Century and had even been briefly renamed Armeville (Arms Town) during the French Revolution. So it was a natural place for Régis Darne to establish a gun-making business. Saint Etienne in the 16th Century had initially been centered around edged weapons such as swords and spears but soon moved into making muskets becoming a national center for gun-making in much the same way as London and Birmingham became centers of the British gun trade. 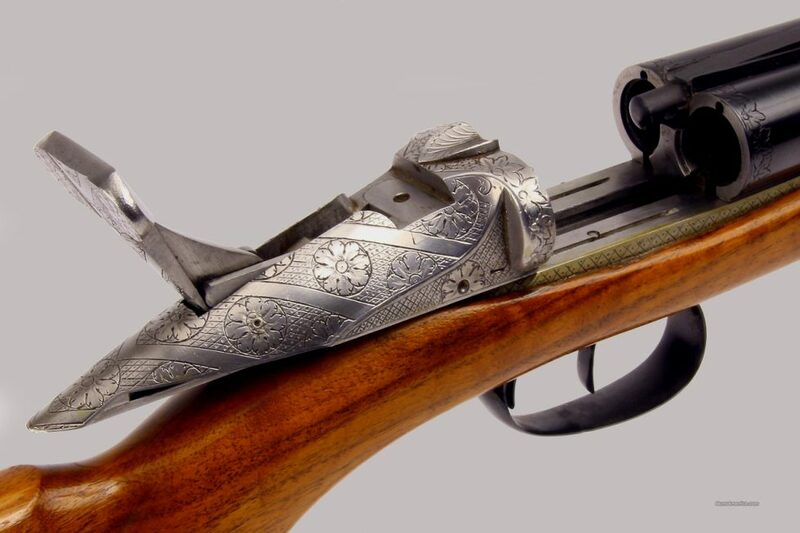 Despite being a double barreled side by side gun the Darne does not open on a hinge like a conventional gun but the barrels are fixed and lifting the handle on the rear of the action slides the breech block rearwards. The extractors and plunger ejectors are visible in this picture. (Picture courtesy steniron.com). What set Régis Darne guns apart from other makers not only from Saint Etienne but also everywhere else in the world was his system of having fixed barrels and a sliding breech block to open and close the gun. The benefit of this cannot be fully appreciated just by looking at pictures or video of a Darne gun in action. To fully understand the beauty of this design it is necessary to actually pick up one of these guns, shoulder it a few times, and then try shooting it. The balance and feel of a Darne is different by comparison to a typical break action gun. The weight of the gun is very much “between the hands” and the effect is one of a gun with lightness and liveliness, a gun that is arguably at its best when mounted and fired from “low gun” or field position. It is a style of gun that has particular appeal to shooters looking for a gun with light and lively handling. The reason for the “between the hands” liveliness of the Darne is apparent in this picture. Note the weight concentrated in the action area immediately above and behind the triggers. (Picture courtesy rockislandauction.com). The breechblock of the Darne sits immediately above and a little behind the triggers. This creates a concentration of mass right at that point of balance of the gun which give it that feeling of lightness in the barrels and stock, a gun that feels centered. If the gun has been fitted to the shooter the whole effect produces superb handling. This Darne gun is currently for sale by Rock Island Auction Company and is expected to sell for a modest price. It is in 16 gauge with 2½” chambers and 27″ barrels. (Picture courtesy rockislandauction.com). If you are someone who would like to get hold of a used Darne gun to try the one in the two pictures above from Rock Island Auction Company is coming up for sale on their on-line auction to be held on 3rd November 2016. You will find the sale page for the Darne above if you click here. This Darne is expected to sell for around USD$600-$900. There are literally hundreds of guns looking for new homes being offered at this auction and you’ll find the main auction catalog page if you click here. 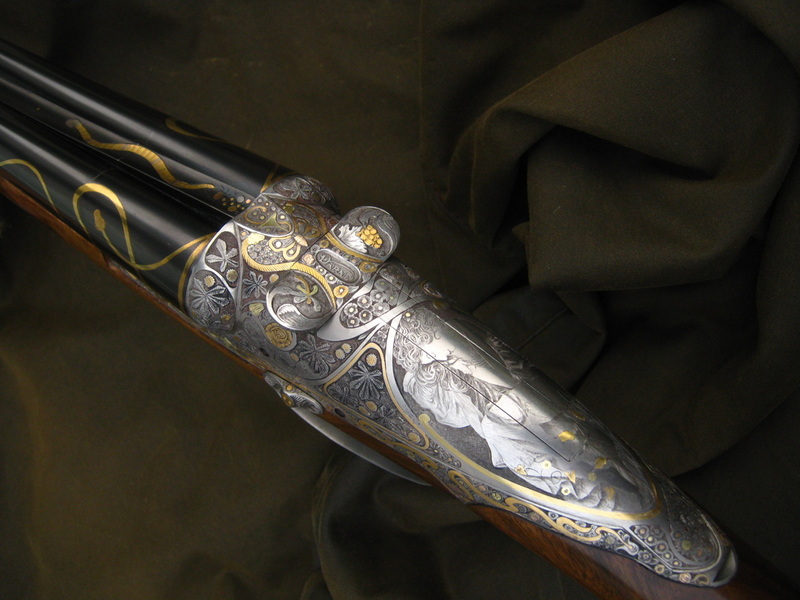 Darne are very much still in business and still making beautiful bespoke guns and double rifles. The company is now called “Société nouvelle des Armes Darne” (the New Darne Gun-making Company) and is headed by Hervé Bruchet who has had a working interest and involvement with Darne guns for many years. A Darne sliding breech double rifle. Darne double rifles are made in metric calibers 8x57JRS, 9,3x74R, and American/British calibers .300 Winchester Magnum and .375 Holland and Holland Magnum. (Picture courtesy Darne). The double rifles made by Darne are made in the metric 8x57JRS, 9,3x74R, and American/British .300 Winchester Magnum and .375 Holland and Holland Magnum. In addition to this Darne also make side by side rifle/shotgun combination guns in 20 gauge 76mm chamber with 8x57JRS rifle which would be a delightful arm for a gentleman’s meanderings in the woodlands able to pick up a rabbit for the cooking pot, deer or boar. 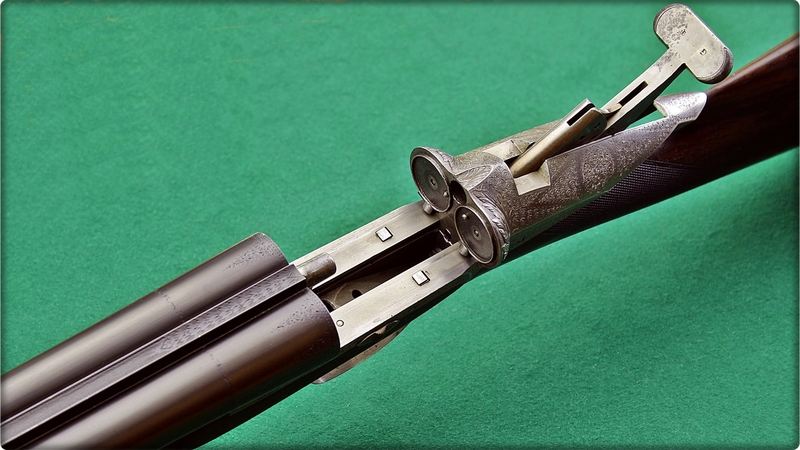 You will find the Darne double rifles and combination guns on their website if you click here. The graceful Darne side by side shotgun is currently made in 12 gauge, 12 gauge 3″Magnum, 16 gauge, 20 gauge, 20 gauge Magnum, 24 gauge, 28 gauge and 410 depending on the model. (Picture courtesy gournetusa.com). Darne side by side shotguns are made in a wide range of caliber options; 12gauge, 12 gauge 3″Magnum, 16 gauge, 20 gauge, 20 gauge Magnum, 24 gauge, 28 gauge and 410 Magnum and in a wide variety of grades of wood and engraving. You will find the Darne shotguns on their website if you click here. US based customers can also find Darne guns and rifles on the Geoffroy Gournet’s Darne website if you click here. The design of the side by side Darne provides an ample area for an engraver to express their art. (Picture courtesy gournetusa.com). Not only do Darne continue to make their side by side sliding breech guns and rifles just as the company’s founder Régis Darne began doing back in the nineteenth century but they also make over and under “superposed” rifles and guns also. Darne make over and under double rifles in 8x57JRS, 9,3x74R, and 30R Blazer. (Picture courtesy Darne). You will find the Darne superposed double rifles on the Darne website if you click here. The Darne superposed shotguns are made in 12, 16 and 20 gauge on the Blitz system and in 12 and 16 gauge for the sidelock version. (Picture courtesy Darne). You will find the Darne superposed shotguns on the Darne website if you click here. Darne guns and rifles are bespoke and therefore expensive. However, the sheer nature of the sliding breech design produces particular benefits both in terms of the balance of the firearm and convenience of operation. It is a design that works beautifully in a sporting shotgun but I think it would work fabulously in a big game rifle in .375 Holland and Holland Magnum also. The ejectors and wide open breech should make it a very quick action to reload. A Darne is a thing of unique beauty. (Picture courtesy gournetusa.com). (Feature image at the head of this post courtesy gunsamerica.com).